LOS ANGELES (AP) At this rate, Justin Verlander might very well hit his first home run for real. A classically poor-hitting pitcher, the Houston ace knocked one over the wall last week at Dodger Stadium in batting practice. Maybe that bolstered his belief that this batch of baseballs is slick and juiced. On Tuesday night, Verlander aims to lead the Astros to their first championship when he faces the Los Angeles Dodgers in Game 6 of a power-packed World Series that’s already set the mark for home runs. ”We’re just making memories right now,” Astros catcher Brian McCann said, a day after he homered. A total of 22 homers so far, more than 1+ miles of dingers. These nightly episodes of home run derby are connecting with fans, too – in much of the country, they stayed up well past midnight to watch Houston outlast the Dodgers 13-12 in 10 innings at Minute Maid Park, TV numbers showed. With each swing, perhaps this Series really is becoming more riveting. 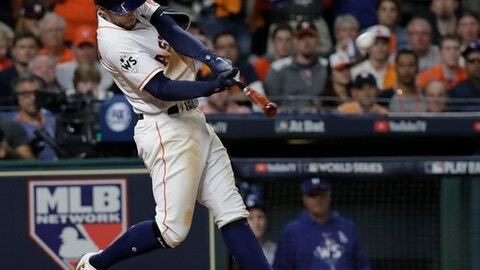 George Springer, Jose Altuve, Carlos Correa, Yuli Gurriel and McCann launched longballs in the Astros’ back-and-forth thriller. Cody Bellinger and Yasiel Puig homered for the Dodgers – seven different players on each side have homered. ”This is not going to be finished Tuesday. It’s going to be Game 7,” Puig said. ”This is the craziest atmosphere I’ve ever played in, the craziest results, just big hit after big hit, big play after big play,” the Houston leadoff man said. Major League Baseball set a record this year for most home runs in a season and, fittingly, Minnesota leadoff man Brian Dozier began the playoffs with a homer. Dodgers ace Clayton Kershaw, meanwhile, has been tagged for a record eight home runs in a single postseason. Gurriel got him in Game 4, and Houston has 13 overall against the Dodgers. Did anyone expect this many at this time in October? Surprising, right? ”I guess a little bit, just because both teams are putting up incredible at-bats in the most important times,” Astros manager A.J. Hinch said Monday on a conference call. Dodgers lefty Rich Hill opposes Verlander in a rematch from Game 2. That night, the teams wound up combining for a Series-record eight home runs, with Houston holding on to win 7-6 in 11 innings. Los Angeles reliever Ross Stripling was among 14 pitchers, seven on each side, who worked in the Game 5 slugfest. ”If we can just hold them to less than 12 runs, we can get some wins,” Stripling said. There were 6,105 home runs during the regular season, an average of about 2.5 homers per game. There have been 4.4 per game in the Series. The ball has been flying out of the ballpark all year,” said Justin Turner, whose tiebreaking homer helped Los Angeles win the opener, when the gametime temperature was 103 degrees.